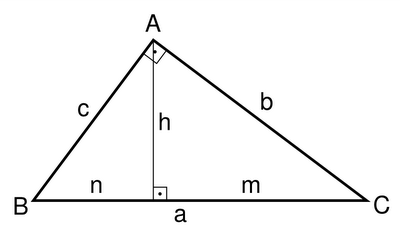 How do you solve for a right triangle when you are provided with only two pieces of information? I am not a mathematician by any stretch, but I do seem to remember enjoying trigonometry even though it seemed irrelevant to me as a teenager. And I do seem to remember needing at least one more angle to solve for a right triangle. Am I correct on this? My 14 year old son, Trevor, one of the sharpest people I've ever met, started on his math homework last night shortly after dinner. His first choice of activity for the evening, like most evenings, would have been playing X-Box online with a few of his friends. However, Trevor is cursed with good hair, athleticism, intelligence, and a family full of educators. Thus, he has no choice but to take learning and school work seriously. As I started to explain, it was about 6:00 in the evening when Trevor started solving right triangles. As usual, he seemed to have things under control, so I went about my business of cleaning the kitchen, feeding the dogs, getting in a quick workout, and checking my Twitter feed. Two and a half hours passed and I wasn't hearing the typical grunts and shouts of a teenager blasting away at zombies. I thought I had better go take a look. Instead of seeing Trevor jumping up and down with controller in hand, I see the frustrated husk of a boy at his desk trying to solve problem number ten. "Still working on your trig? ", I ask. With sagging shoulders, watery eyes, and a faint voice, Trevor says, "yea". Never one to accept failure lightly, Trevor had been struggling with problem ten for the past two hours. I pulled a chair up next to him and asked to take a look. I see the rest of his three page math packet is complete and he has checked his work. Problem ten is a word problem; two cyclists take off in different directions, blah, blah, blah. The pertinent information that Trevor was given to work with was one right angle and one adjacent side measuring fifteen miles. He had drawn diagrams, tried to use Pythagorean theorem, tried laws of sin, cos, and tan, saved several equations on his calculator, and had exhausted three pages of loose leaf paper, and several note cards in the process. Trevor mentioned using his smart phone to watch several Kahn Academy lessons, a few more YouTube videos, and had just completed a fairly extensive search of Google when I arrived on the scene. We spent the next hour hammering away at that problem by plugging in educated guesses. Personally frustrated, I asked him to set it aside and come have an ice cream cone. As he was peeling the wrapper from his Drumstick I could tell he felt defeated and upset. I told him that his perseverance and determination were far more important than finding the correct solution to that ridiculously challenging math problem. We discussed the concept of grit and the research that suggests it's importance to success. I told him that I was very proud of him, and asked him to not crunch the cone with his front teeth, newly clad in Dr. Foley's orthodontic craftsmanship. I also shared Angela Lee Duckworth's terrific TedTalk on keys to success. As Trevor dragged his weary body up to bed, I suggested that he discuss problem ten with his classmates and teachers the next day. Collectively a solution might be found. My words were of little solace. We had lost this battle, but to his credit, he wasn't giving up, and neither was I. Not only was I feeling bad for my son, but now I was losing sleep trying to come up with a solution to a problem pertaining to a subject that I studied more than three decades years ago. I was struggling with more than a missing angle, I was also struggling with the concept of homework and its intent. Alfie Kohn never looked more correct than he did this night. I had tried to spin a positive message of grit and resiliency to my son, and I was truly proud of his effort, but I fail to see the learning value of frustrating tasks such as problem ten. My son's interpretation of the episode is that he wasted nearly three hours trying to solve an insolvable problem, along with another hour listening to his dad try to make sense of it. I am sure that we both lost sleep trying to magically come to grips with our respective puzzles. As an educator, I recognize that so much of what is being assigned as homework has such little value on a student's learning, but as a parent I simultaneously admired and worried about my son's tenacious efforts. My conundrum was leaving me awake and conflicted. I finally dozed off with the hope that somehow, in the long run, my son will be a better person for a having gone through this missing angle ordeal. But I still had doubts. Those doubts were confirmed today when I asked my son about the solution to problem ten. He said that he discussed the problem before school with his classmates. Their answers were merely guesses, and most had not bothered an attempt. Before I could even ask, Trevor said the teacher collected the worksheets and didn't provide time for questions or discussion. He had seen through me and recognized my attitude towards meaningless, ritualized homework. With clarity, my son learned a vivid lesson on the differences between school and learning. Did I do the right thing by praising Trevor's grit with problem ten, or should I have been honest from the beginning about my professional opinion regarding homework? What would you have done? What advice would you give to teachers, and to parents, regarding homework? I think it is important for children to understand that to succeed is to build a sense of responsibility. It is good that he tried his best to solve problem 10 on his own (that is why home work is given, to encourage independent work). I always tell my students and teachers that it is alright to make mistakes when they do their homework. It is not important to get everything right. It is the process of trying that is important. Teachers should go through all the assignments given in class. The purpose of mathematics is to train children to think rationally. Real life examples are useful but the value of mathematics extends far beyord that. It permeates other subjects such as the sciences,geography,geology and even art and music and many more. Even more than that, it helps children to appreciate the wonders of science and life well into adulthood. We should only worry when children give up even before trying. Thank you for shedding a refreshing perspective on this. What's troubling to me with this scenario is the lack of a framework that you describe. I still question the value of assigned homework, but I agree with the notion of responsibility for one's own learning without fear of failure. I am a business and I.T. Teacher of 18 years in Queensland Australia. I had not given HW very often for various reasons. Firstly, I disliked doing when I was a student. Secondly, I found that my students came from very different family situations so I could never get most of the students with complete HW even with detentions as the result. Thirdly, I teach approx. 150 students and I would run out of teaching time when I went through the HW that half of them hadn't done. Lastly, HW chasing affecting my relationship with my students. Since having my sons who are 10 and 11, I must say I don't see one good reason for HW. I have had some of my most relationship eroding situations over HW. All the reasons for giving HW that educators and parents think are valid(such as - working independently, developing routine, keeping parents in the know), just aren't. There are far better ways to achieve these goals. HW interferes with families spending positive times together, kids letting their brains rest, kids doing their share of helping jobs and kids being active. I would suggest that the only good HW is reading and times tables. If parents want to know what their kids are doing at school, send their maths book home, kids who already know how to do it are the only ones who do HW independently, etc. It has also been proven in studies that HW makes no difference. All in all, I am not much of a fan. Hello Brenda. Thank you for taking time to read my post and share your insights. If more educators would start with "WHY", then some of the angst created by HW could be avoided. When learning becomes self-regulated and meaningful, our internal construct of homework changes dramatically. Learners of all ages will readily put time and effort into endeavors of value. Thanks again Brenda - I enjoyed reading your perspective. I know that I am late to this conversation, but it has been very interesting to view. I find the subject of the importance of homework extremely interesting. I agree that learners "will readily put time and effort into endeavors of value." As a freshman English teacher, my major concern is that I am always clear with my students as to the purpose or target for the work I assign, whether it is in-class work or independent (homework). I believe that students will more readily put in the effort if they understand what the "practice" is preparing them for in the long run.